What is speed, comfort, style, and affordability, wrapped up in a pair of wheels? Don’t guess any further than the Pure Fix Original Fixie Bike. They say give a man a fish, feed him for a single day. Teach a man how to fish, feed him for a lifetime. But others say, teach a man how to cycle, and he will realize how fishing is stupid and annoying. Nothing screams of cycling in its purest and yet simplest form than the pure fix original review. They have always made sure that all bicycle lovers find something to get their year on. This time the Pure Fix Original Fixie comes with a whole package of goodies. From rear hub flip-flops for unmatched cycling experience to a lifetime warranty on the bicycle frame and fork and many more, definitely, this is not a deal to shrug off. When it comes to bikes, we all seem to want the best. You might be interested in your own bike or in some cases, you want to buy one for your kid or a present for a friend, the fact is, no matter who it is, you need the best of the best. The Pure fix Original comes with a fully Tig-welded high tensile steel frame and fork that is durable and assures a long lasting life of the affordable bike. The bike stem consists of alloy metal specially crafted by Pure Cycles. The elegant urban design and geometry of the bike frame allow it to hit the road with speed and with impeccable style. Handlebars are made of Pure Cycles 30 mm alloy Riser. The grips are made of Pure Cycles rubber and they do not possess any flange. 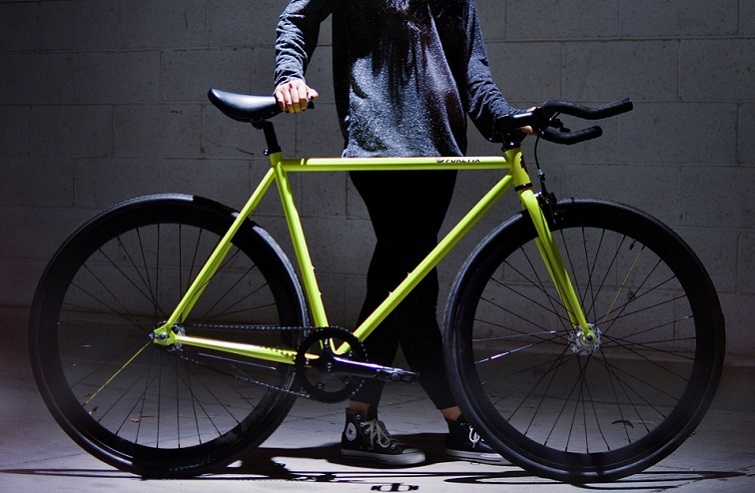 The fixed gear single speed bike ride has a deep dish 50 mm wheel to keep the rider connected to the comfort bike and the ground for unparalleled cruise experience. Rear wheels possess alloy flip-flop hubs to allow changes from fixed gear to single speed with ease. The entire wheelset consists of 40 mm Deep-Dish 32-Hole rims. The pedals are made of 9/16 inch nylon slim pedal material. The flip-flop hub will give you the power to change out the single speed to a fixed gear bike. 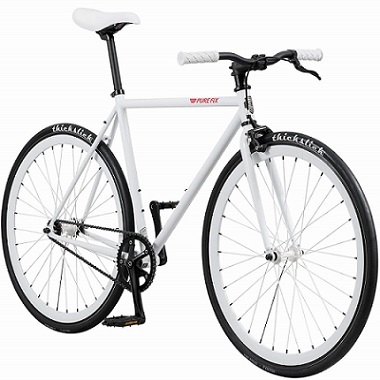 This makes the Pure Fix Fixed Gear Bike ideal for anyone who lives in a city or countryside that has a lot of hills. Changing these two is easy which will make sure that your commute every day is as comfortable as can be. On top of this, it is a great way to exercise each and every day. Not many bikes can boast of having this quality. The bike’s frame is made of high-tensile steel that makes it a durable beast when riding around in all kinds of terrain. The bike fork is machine welded to the frame, making it all the more durable. The rims are also powerful meaning that they will not bend or break when you hit those potholes. All riders dread that time of the day when the sun goes down. It is dangerous to ride at night, especially in the streets. Well, this bike has a solution for that. With the ability to glow in the dark, this bike will make sure that you get seen, all thanks to the solar-powered paint. On the upside, you will not need to wear any bulky and uncomfortable clothes to make sure everyone can see you. This bike is practically made out of high-quality components. It has a Neco headset and a Zoom seat post which help provide comfort while you are riding. Additionally, it has Oury grips which make sure that your hands are not scraped up. The tires are also very durable, in short, the bike will last a long time. Doesn’t require a lot of maintenance. Due to the high-end products that make up the bike, you will need less servicing, thus you will not always find yourself in need of new parts. What’s the fun of riding a bike without having one or two extra to spruce up your energy and keep you occupied as you ride is why there is a wide array of bike accessories that could be mounted on the bike frame and handlebars to ensure you always have your tools with you everywhere you cruise. The Pure Cycles team ensures that there is something for everyone. That is why they have made the Pure Fix Original Fixie available in different sizes and colors as well. The sizes range from small to large whereas, with the colors, there is a wide range of elegant and sophisticated colors to pick from. The bike does not need any particular expertise. You will find that most of the parts fit just well. The bike is a bit pricey, this may come due to the parts used and the service it provides. Parts hard to find In case of any damage, you will find that the bike parts are a bit hard to see this mostly you will have to settle for what you find in the market. To sum it all up, your best bike is the one that you ride every day, and the bike that you ride every day is probably the one that you truly love. So make that effort to find your passion and hit the road with the Pure Fix Original. You will never know the surprise it holds for you until you own it.